I am a huge Marvel fan, so when they started doing all of "The Avengers" movies (Iron Man, Captain America, Thor and The Incredible Hulk) I was all kinds of excited. Then they branched into TV with "Marvel's Agents of S.H.I.E.L.D." My husband and I were there for the premier episode and have been hooked ever since! The beauty of the show is that you don't have to have seen any of the movies to follow along. But if you are into the movies, the show definitely follows the same time line. It's brilliantly done. Here's the premise -- S.H.I.E.L.D. Agent Phil Coulson, played by Clark Gregg, is back to head up an elite team of agents in investigating strange occurrences around the world, including Hydra. 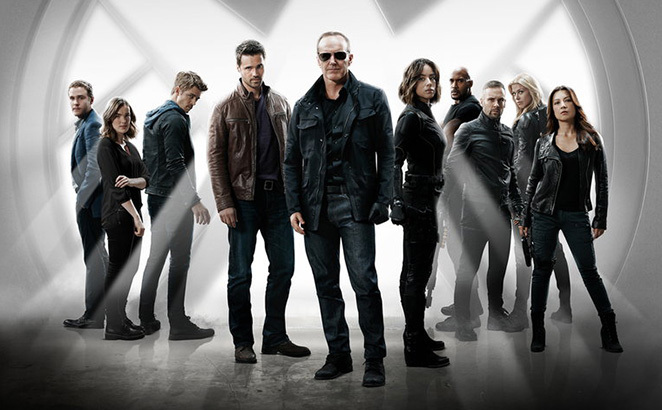 As of this season, the main cast is comprised of 10 people, including the previously-mentioned Clark Gregg as Phil Coulson. Chloe Bennet plays Daisy Johnson, known as Skye in the first two seasons. She's undoubtedly the lead female role; the first two seasons really center around her, particularly her true identity. Turns out, she's what's called an inhuman and has powers that she must learn to control. Leo Fitz (Iain De Caestecker) and Jemma Simmons (Elizabeth Henstridge) are everybody's favorite 'ship.' And in true shipper fashion, things just never seem to work out for the two geniuses. Agent Melinda May (Min-Na Wen) is known as the cavalry. She's a certified badass, and her sarcasm is on point. Grant Ward (Brett Dalton) is the perfect bad guy, and the writers set his character up so perfectly, making me fall in love with him before revealing his true self. For two full seasons I kept hoping Ward was really a good guy who had just been brainwashed. Now in season 3, Ward's body has been taken over by Hive, a really super creepy, evil alien bent on destroying the world. My new favorite character is Lincoln (Luke Mitchell). He's funny in a dry way and his inhuman power is awesome. I also like the way he struggles right and wrong. It's very relatable. Plus, I like that Lincoln and Daisy are a thing now. The other main characters of the show are Lance Hunter (Nick Blood), Alphonso 'Mack' Mackenzie (Henry Simmons) and Bobbi Morse a.k.a. the Mockingbird (Adrienne Palicki). That seems like a lot of people to keep up with, but trust me, when you're watching the show it's really not that complicated. If you're a fan of "The Avengers" movies, I highly recommend Agents of S.H.I.E.L.D. If you're a fan of superheroes, aliens, good vs. evil -- watch this show! Even Rotten Tomatoes agrees with me, giving the third season a 100% rating saying the show "further hits its stride with a blend of thrills, humor, and heart." You can watch every episode of AOS online at ABC GO. This was written before tonight's episode of AOS, which will air on ABC at 9:00 p.m. EST. Mrs. Shady and I are Shieldies and have followed the series from the beginning. As you might recall, Chloe Bennet "guest hosted" SDMM twice when she was still known as Skye. I agree that AOS is hitting its stride this season, injecting more humor and sexual tension. I read that Nick Blood and Adrienne Palicki will star in a S.H.I.E.L.D. spinoff series, possibly as early as this fall. Mrs. Shady and I also watch Arrow, The Flash and Daredevil - all highly recommended. Have a great day, dear friend Ashton! My station is responsible for running the local CW channel so when the first promos for Arrow started playing I knew I would like it. However, where we live satellite is our only option & only one carrier actually offers internet where we are. Long story short - we don't get CW. I'm definitely an Avengers fan. I'll have to check out this series.